No indeed, Steve's 68 moths last night would have amounted to almost as ambitious a target for me as some of the political ones I've been hearing recently! It was cold and clear when I retired last night (shortly after the 'exit poll' results were announced) and I had modest expectations of the two actinic traps I had put out. In the event, they attracted 20 moths: 10 Hebrew Characters, 5 Brindled Beauties, 2 Common Quakers, a Shoulder Stripe, a Parsnip Moth and a Muslin Moth (FFY here). 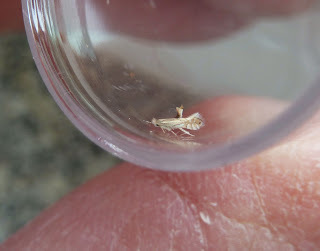 However, yesterday I made a routine inspection of the window in my wood shed and found a tiny moth which I believe to be the Gracillariid Phyllonorycter harrisella. Perhaps someone would be kind enough to confirm or refute this if it's possible to do so from the image - a very difficult subject to photograph being only 3mm long and very pale. P.S. I think that the large dorsal tuft must be its raised abdomen because it wasn't like that yesterday! Thanks George. I had ruled out P messaniella because of the pale ground colour. I haven't any better images so I guess that the matter will remain unresolved.